A Railway Journey through the delightful "Little Switzerland" countryside of the Ohio Central Railroad is like watching a Currier and Ives landscape coming to life. A period passenger train, featuring open window cars from the early 20th century and pulled by perfectly preserved steam locomotive offers riders a novel and exquisite view of the rolling hillsides and quaint Amish farms. 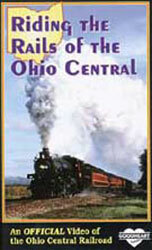 In this video you'll find stirring action views of three locomotives used by the Ohio Central: No. 1551, a 10-wheeler built in 1912 for the Canadian National RR, No. 13, a Consolidation built in 1920 for the Buffalo Creek and Gauley short line in West Virginia and No. 1293, a Pacific-type locomotive built in 1948 for the Canadian Pacific Railroad. Watch the billowing smoke plumes and listen to the melancholy steam whistles of the iron machines that built a great transportation network.